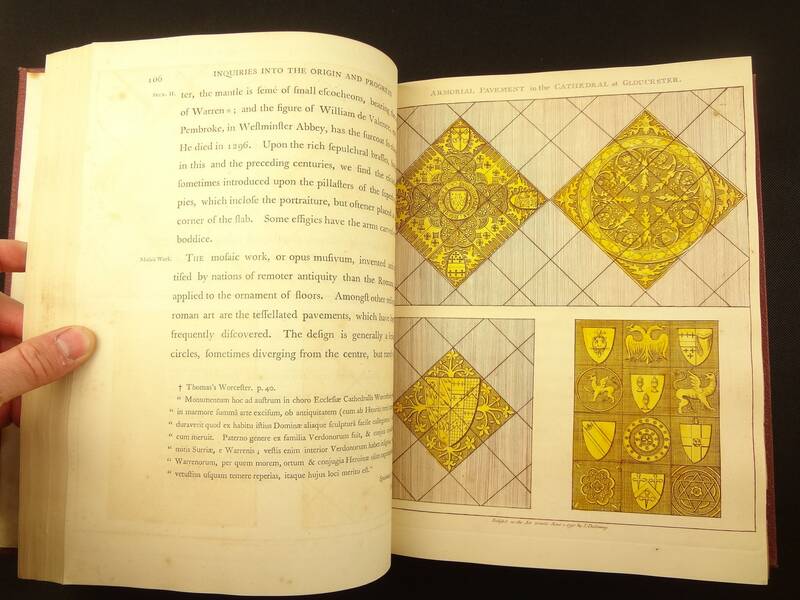 A cost effective working copy of this important treatise on Heraldry; the pages are complete (excepting a1-a2, likely blank), but it is missing 12 of the 27 plates it was to come with. An interesting association can be made. 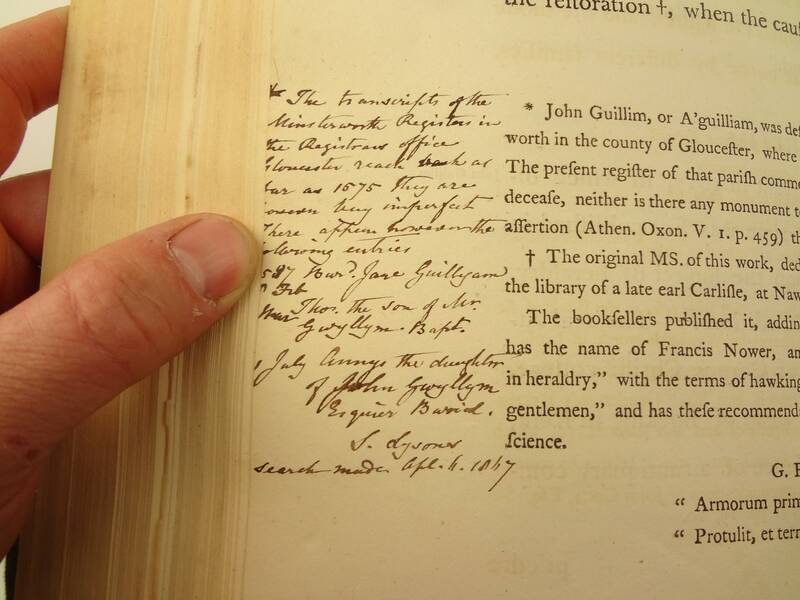 There's a dated manuscript annotation (see pictures), signed by "S. Lysons", likely Samuel Lysons, whose father (of the same name) the author, Dallaway, served under at Rodmarton (see author note below). 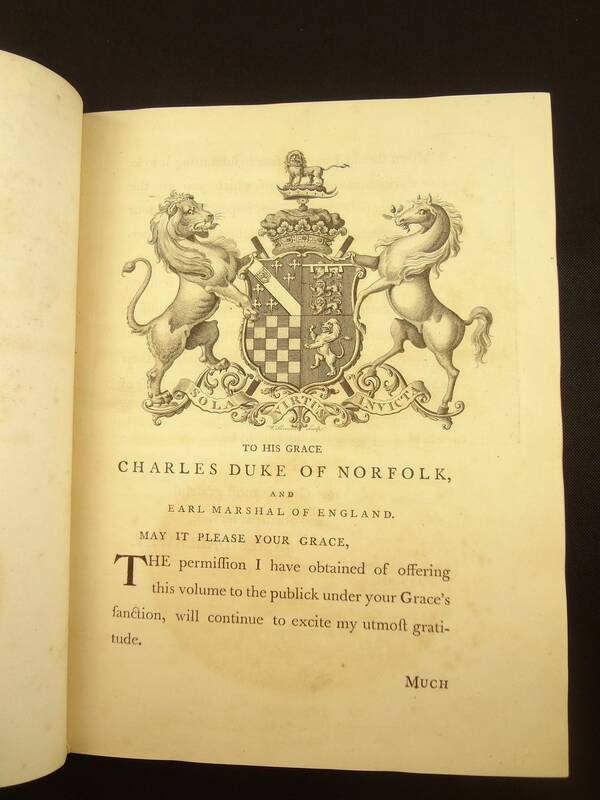 Inquiries into the origin and progress of the science of Heraldry in England. 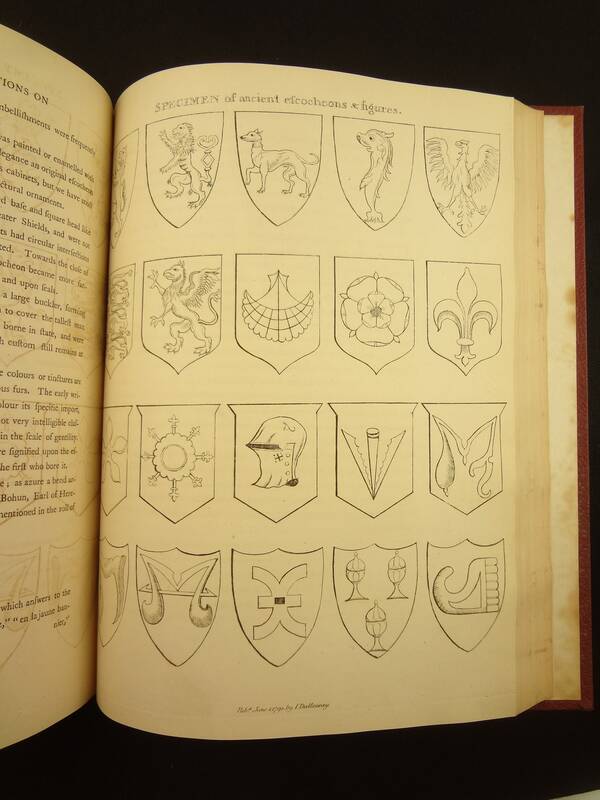 With explanatory observations on Armorial Ensigns. With an appendix of illustrations. (Other works included:) i. 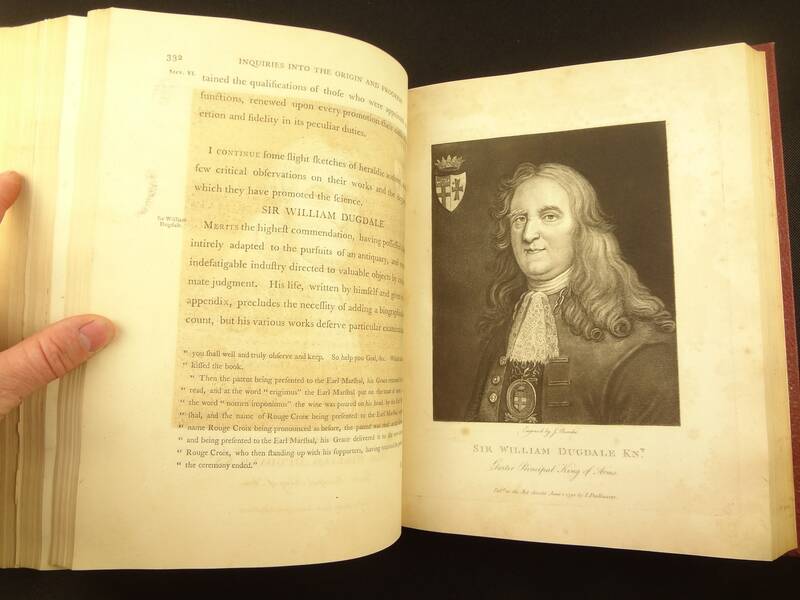 Life of Sir William Dugdale . . . written by himself. Ii. 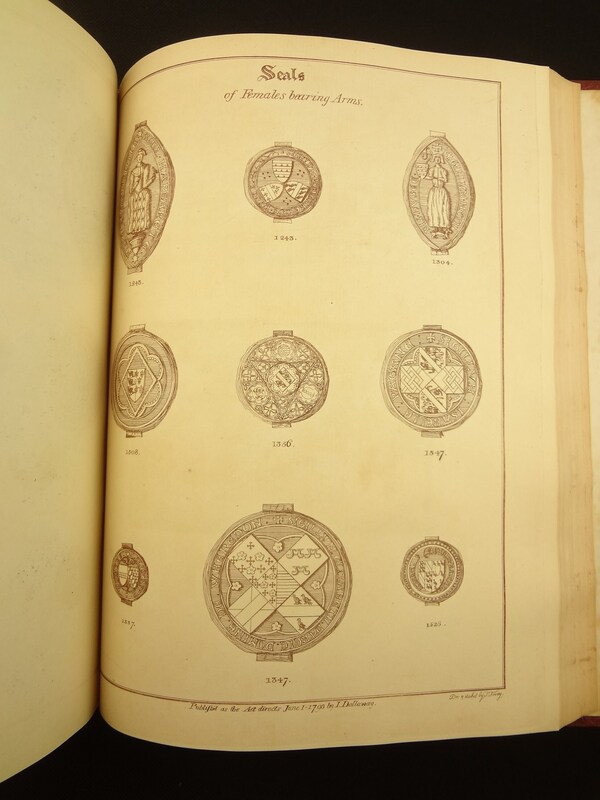 Life of Gregory King, Lancaster Herald, from his own manuscript in the Bodleian Library, m. A Catalogue of all the Officers of Arms, from their first establishment to the present time. iv. 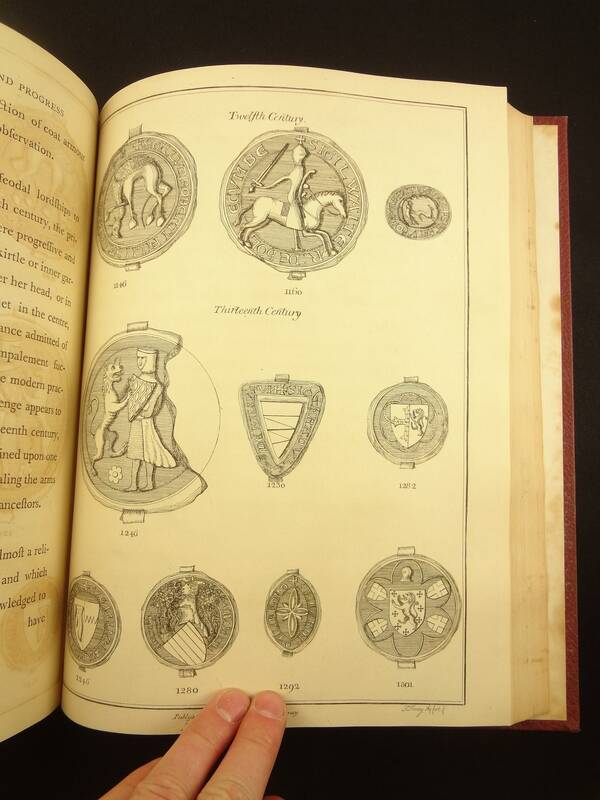 Editions of books published in England on the Science of Heraldry, v. A genuine copy of the Book of St. Alban's (Armorial Bearings portion), first printed in 1486. Dallaway was born at Bristol in 1763. He was educated at Trinity College, Oxford, from where he graduated BA in 1782, and MA in 1784. He failed to obtain a fellowship there, supposedly because he had written some satirical verses on a senior and influential member of the college. 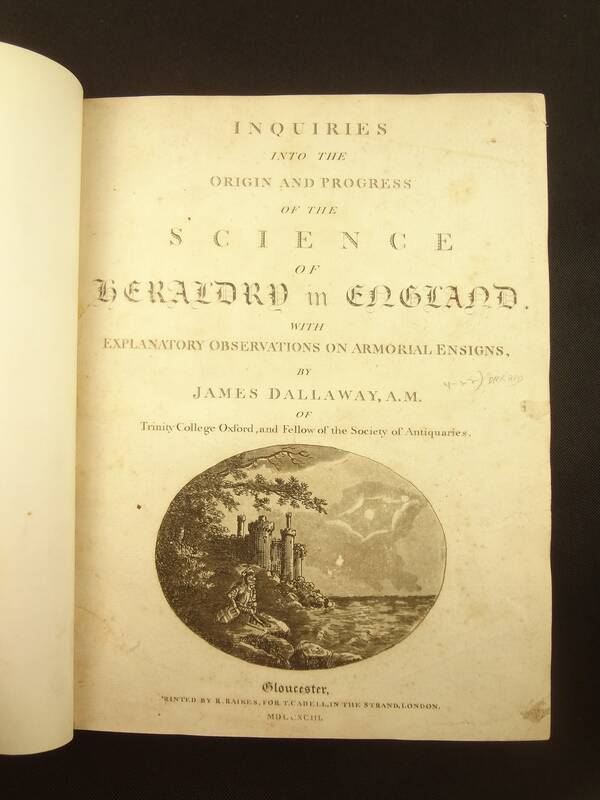 Having been ordained deacon in 1785, Dallaway served as a curate at Rodmarton, Gloucestershire (serving under the Rev. Samuel Lysons, father of the antiquaries, Daniel and Samuel). 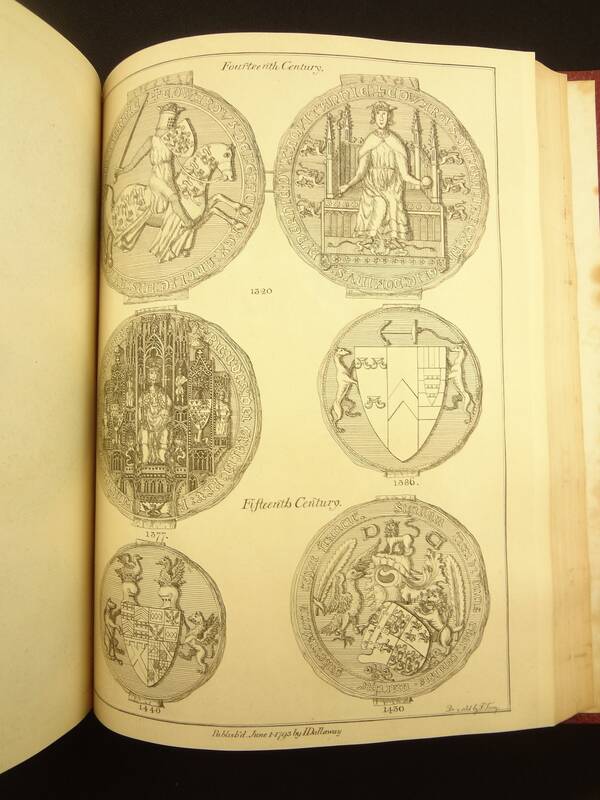 He was elected a fellow of the Society of Antiquaries of London in 1789; and in 1793 he published Inquiries into the Origin and Progress of the Science of Heraldry in England, with Explanatory Observations on Armorial Ensigns. Measures 30 x 23 x 5.5 cm. 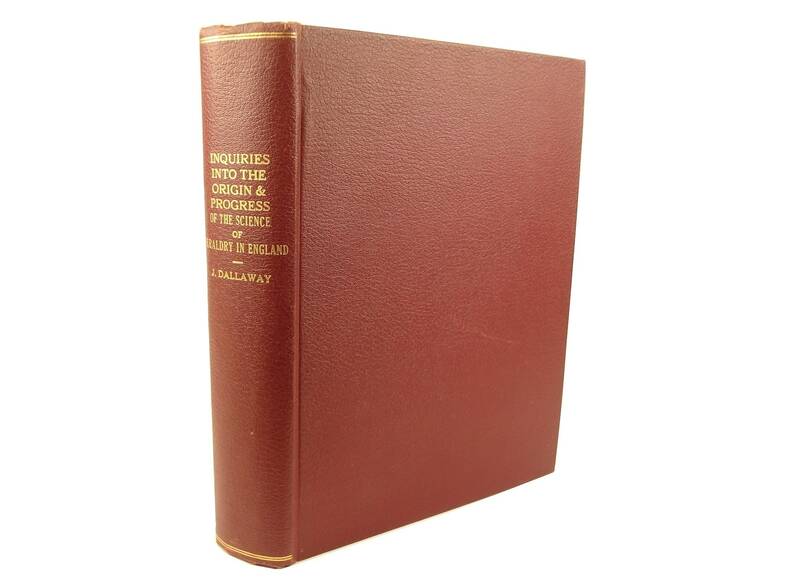 Library-style hardcover binding (leatherette). 15 of 27 plates, and one fold-out; numerous tail-pieces, a printer's mark, and a dedication woodcut. Pages - (2), title, dedication, xiv, 424, "appendix" - 1, "contents" - 1, cxii, (2). See pictures. A great working copy, used as such for many years. Modern library binding (heavy duty), with title and author in gilt on spine. A little edge wear. Some thumbing. Occasional and light foxing and annotation throughout. Title page thumbed. 12 plates missing, 15 plates and fold-out present. A1, likely blank sheet pre-title page, missing. Plates ghosted onto facing pages. Pages 161-166 have a moisture mark at top-edge, no text affected. The binding trimming trimmed annotations and the top-edge text on occasion.